We just walked the beautiful Skerwink Trail, which is reachable by a short path from our house rental. 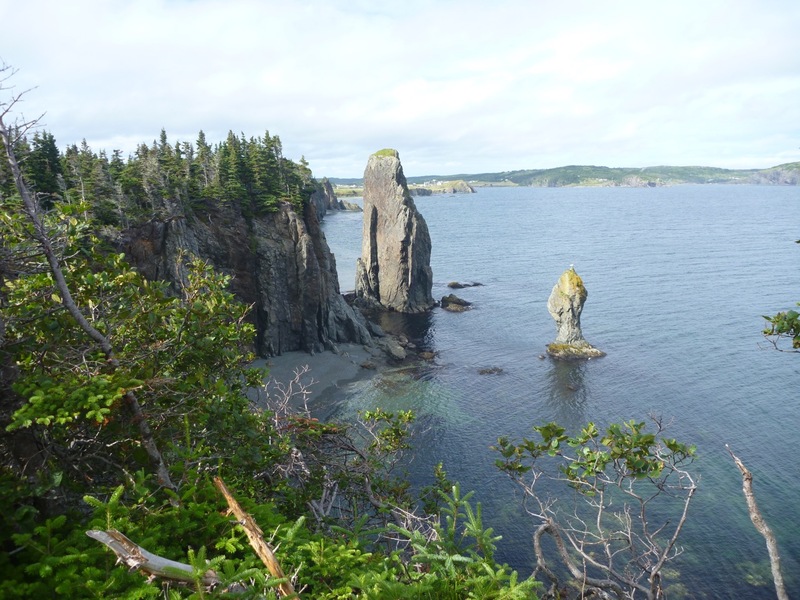 The trail loops around Skerwink Head, a rocky peninsula between Port Rexton and Trinity East, Newfoundland. The peninsula is mainly sedimentary rock, especially sandstone. It’s been shaped into fantastic cliffs, sea stacks, arches, and beaches by the Atlantic storms and freeze/thaw cycles. Along the walk we saw whales and seabirds, wildflowers, mushrooms, edible wild berries, and a variety of habitats, including determined plants on steep cliffs, mixed forest, craggy meadows, tuckamore, bog, freshwater pond, birch tree clusters, and gravel beach. The early day was foggy and drizzly, but by late afternoon the sun was shining. A gentle breeze turned into a stronger wind than I liked in the exposed areas. The trail is considered moderate–difficult. Numerous steps, boardwalks, and rails are what makes it moderate. There is also good signage, including several “Caution” or “Danger: Unstable cliffs.” As an accomplished acrophobe, the recommendation for caution was unnecessary for me. I could easily see the danger, and instead wished for a “Turn back now!” sign. We celebrated the end of the walk with a dinner of fresh mussels purchased from a roadside truck at Trinity Bay, where they’re farmed. Steamed in white wine and accompanied by some garlic mayonnaise, they were delicious. It didn’t hurt that the price was a little over $1 (US)/pound. You can see some of the sights in the slides below and on the Skerwink Trail site. Ballston Beach in Truro had another breakthrough with this recent storm, effectively making North Truro and Provincetown into an island at high tide. You can see some photos we took at low tide yesterday afternoon (click to enlarge) and below that a dramatic video taken by Bobby Rice of Truro.